People, I am pleased to say, my search is over. Please excuse the hasty rush job on these nails, I got over-excited when they were drying… Sigh. Anyway, I hope you can see that gorgeous shade on the bottom thumb there – that is the gold of my dreams! What is this exotic metallic varnish called, I hear you cry?! Why, it’s OPI’s Goldeneye! 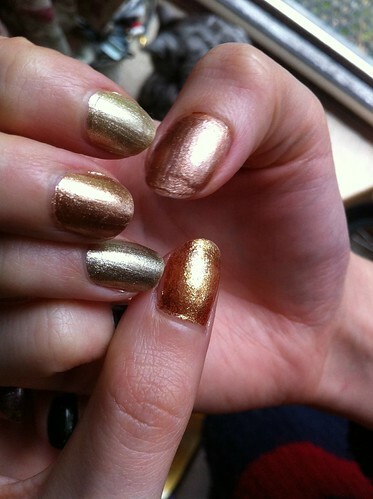 The MUST-HAVE gold varnish for 2012, I reckon! In a clockwise fashion from the bottom, these are the ‘gold’ varnishes I am wearing: Goldeneye (OPI, the clear winner), Gold Coin (Revlon, just not at all what I hoped for, it’s basically just silver!) Glimmer (TopShop, my second favourite, but more of a bronze), Gold (GOSH, another tame looking gold), then Star Dust (Rimmel, another bronzy one). Here, though, is the clear winner. Isn’t it beautiful? You can purchase this shade from HQHair for £11.